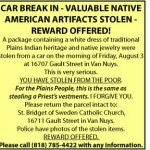 VAN NUYS, CA — On the morning of Friday, August 3, a package containing a white dress and jewelry of traditional Plains Indian heritage was stolen from a car at 16707 Gault Street in Van Nuys. Diane Petersen, caretaker of the items, is asking for the return of the worn box containing the treasures. She is asking whoever took the items to return them to St. Bridget of Sweden Catholic Church, 16711 Gault Street in Van Nuys. She says “This is very serious. You have stolen from the poor. For the Plains People this is the same as stealin g a Priest’s vestments. I forgive you. Please return the parcel intact.” The LAPD is aware of the situation and has photographs of the items. A reward is being offered. The white dress contained in the package is a traditional garment that was prayerfully made to keep the memory of Native American people alive in the world, as well as to engender even deeper respect of those from the Gathering of Native Nations to remember their roots. It was en route to its destination at the time of the theft. If you have any information about this dress and other treasures enclosed with it, please call St. Bridget’s Church at (818) 782-7180 or call the Los Angeles Police Department at 1-877-LAPD-24-7 (877-527-3247). Anyone wishing to remain anonymous should call Crime Stoppers at 1-800-222-TIPS (800-222-8477). Tipsters may also contact Crime Stoppers by texting to phone number 274637 (C-R-I-M-E-S on most keypads) with a cell phone. All text messages should begin with the letters “LAPD.” Tipsters may also go to LAPDOnline.org, click on “webtips” and follow the prompts.